Location: new york sewers yo! As a kid watching the 80s cartoon, it was Raphael. Because he wore a red mask and red's my favorite color. Then, as I got older, I'm like 'hey, Raph's funny!' And then as other versions came out, I started to realize that Raph is a huge buttface with anger issues. I didn't understand this until I started reading the comics. Raphael's my favorite turtle fo sho ^-^d But it's sometimes really hard to choose when all of the turtles are just so awesome! Leo and Mikey are a very close second depending on which version. In the OT Cartoon it was Shredder and Krang as well Rocksteady and Bebop but also Baxter was pretty nice but i prefered his Comic appearance, it just fit better to him as the whitewashed Version. Also his personality was way more interesting in the IDW Comics. Way more sinister. From the Comics i liked Karai pretty much as well Quanin(the Father of Krang), weird way i not really liked the Comic Version of Krang, i prefered the Cartoon one. Else from the good guys i say Raphael as i can relate to his Anger issues and Aggression on certain situations. "Shredder, why don't you make love to me anymore?" Krang - both Fred Wolf and IDW - has really pulled me in, to the point that I've developed more on him for my tmnt concept than any other character. Which is a terrible situation for me to be in. I enjoy Ch`rell if only for how hilariously one-note his goals are. It makes me wish we'd been given a more fleshed out backstory to better understand them. To the level that Baxter Stockman got. 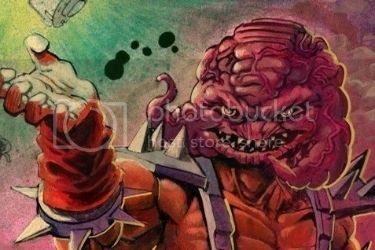 Though, it wouldn't be wise to put IDW Krang and Ch`rell in the same room. That would take less than ten minutes to turn ugly. As for turtles, I feel the need to lean toward Donatello in most versions. TMNT 1990: Probably Splinter because of how awesome Kevin Clash and the Henson Creature Shop were as a team, but also Mikey (even though my all time favorite turtle is Donatello... I just hate Corey Feldman playing him). I know I didn't comment on the other movies in the tetralogy, Image comics, Next Mutation, 2K3 or the new movies, but that's because I'm either not familiar enough with these parts of the franchise or simply don't care as much about them. Donatello. Knowledge of science and technology, and he would always question "hocus pocus" I never believed in (like ghosts, witches or even Santa Claus). The kind of person he is; all that integrity, his values, his perspectives, his approach to things/life, what he stands for, strives for, and where he stands within himself as a person and determined to be true to that and work hard to be the best he can be... Just something so admirable in that. And often relatable. When the others in the last film would be saying "Lets all be human!" he's the one essentially saying, "Hell no. These are the cards I was dealt in life, and I'm going to play them the best I can; no cheating." He won't take the easy rout if it doesn't feel right to him, instead he'd carry the burden and climb the mountain to gain from it later. Admire the heck out of that. Amazing description, and I agree. Leonardo is also my overall favorite, and I basically love him best in all the different incarnations. My favourite character is Mirage Raph. 1987 Shredder, with 1987 Krang as a runner-up. They are very funny together. I can't believe I missed out on this thread since coming up two years ago! Anyways, favorite Turtle depends on the incarnation. More often than not, it's Raphael. I always feel he's got some of the best ideas for storytelling and moments between him and either Michelangelo or Casey Jones are some of my favorites. The placement of Donatello, Leonardo, and the aforementioned Michelangelo depends on version; Mikey and Leo are often neck and neck for second on my end. As for secondary, I'm going to give a vote to Leatherhead. Can't go wrong with the bestial gator himself. Mirage and with what I've seen so far, IDW, are the definitive picks for me. All time favorite TMNT character though (unless challenged in the future) is Baxter Stockman. I love Casey I got a soft spot for him. Him, Mikey, 2003 Usagi, and Renet are my fav. I'm a Shredder guy, myself. I have also always loved Granitor, Leatherhead and Usagi. It's hard to pick a favorite. Better to die on your feet, than live on your knees.